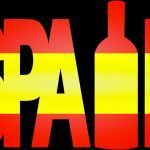 In Spain there is a great variety of tapas that every traveler must try during their visit to Spain. It seems like every one of the Madrid tapas is more exquisite than the one before. You won´t be able to resist the temptation of savoring all the tapas served to you on the table or even at the bar. 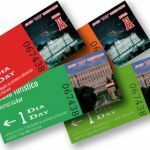 You’ll be trotting around the city center burning them off, but you just might end up putting on some weight… Everyone that comes to Madrid remembers three things: the beauty of the city, the hospitality of its people and the Madrid tapas. 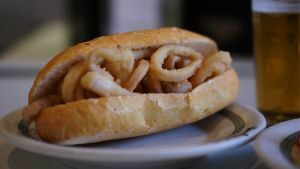 Starting off in the ranking of the Madrid tapas is the Madrid’s infamous calamari sandwich, a symbol of Spain’s capitol city. It even has its own world day: April 14th. Madrid does not even have a coast yet we are known throughout Spain for this fish sandwich, go figure, but we love our seafood in Madrid, in fact we have the biggest wholesale fish market in Europe! Everyday fresh fish is driven in by different national ports. One of the most popular Madrid tapas is the Spanish tortilla. It has to be one of the simplest recipes ever: potatoes, eggs, salt and olive oil. Its simplicity is what makes it to so delicious! 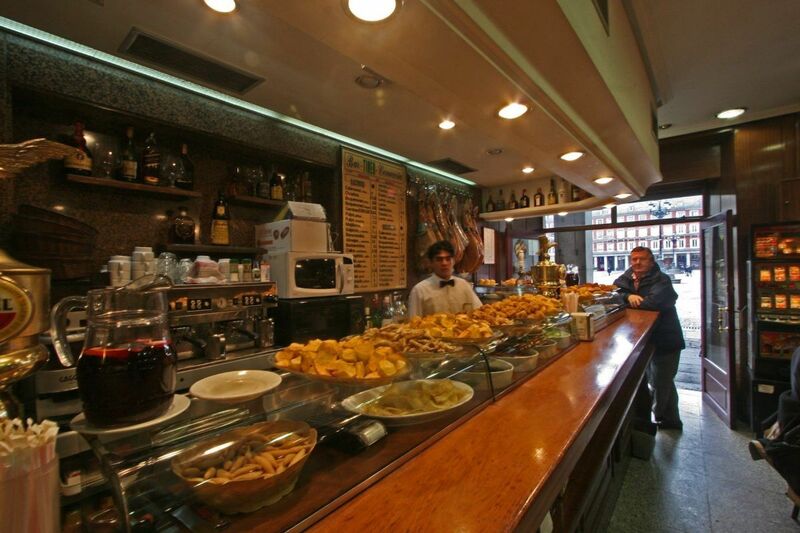 Where to eat it: Cerveriz Bar, Plaza de San Miguel, 2. 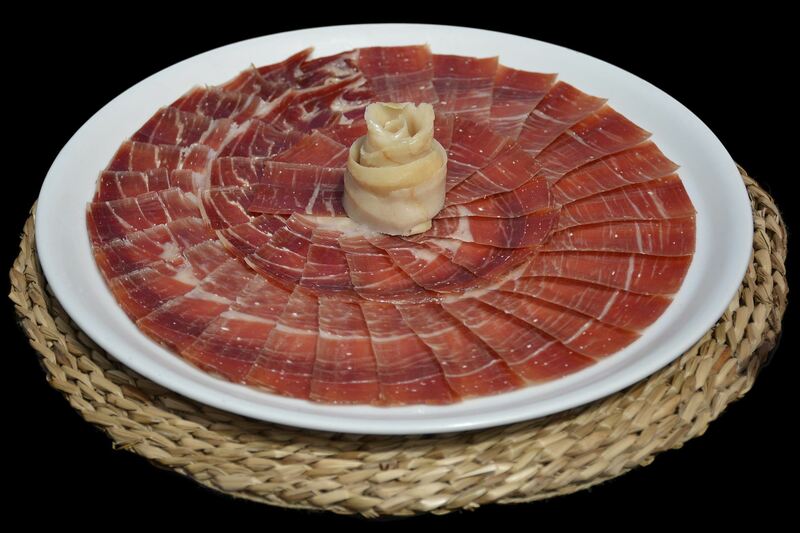 Serrano ham is one of the most popular Spanish food known worldwide. There is a great variety depending on the region where it was cured. 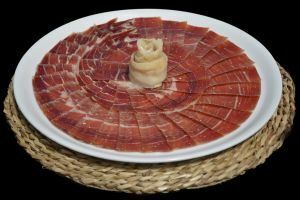 Madrid is a melting pot of peoples from all over Spain and this type of ham is a Madrid tapas must. All you need to accompany this delicious cut is a slice of bread, a bit of olive oil and freshly sliced tomatoes. Where to eat it: Museo de Jamón, Plaza Mayor, 18. Paella is another typical dish that can be shared at the table, it’s known worldwide. 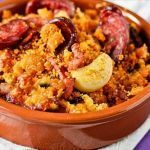 In Spain we can find a great variety of paellas, but as mentioned earlier, we have the biggest seafood market in Europe, so our Madrid paellas have an abundant amount of ingredients, we like to say that our Madrid paellas have land, air and sea: veggies, meat, seafood and shellfish. Where to eat it: Casa Nicasio, Calle Union, 10. 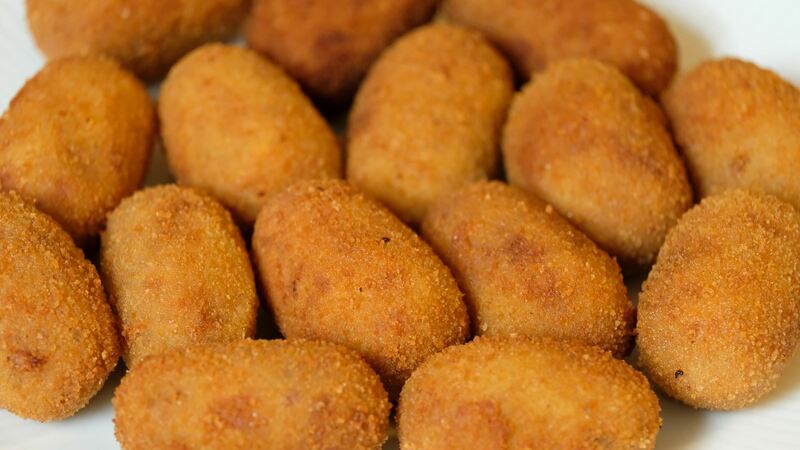 The Spanish croqueta is another one of our famous Madrid tapas that you must try during your stay in Madrid. The most popular ingredients for croquetas can be cod, ham, spinach, or chicken, more and more restaurants are mixing in new ingredients, but we recommend the cod ones, there is a tavern that has been making cod croquetas since 1860, that we highly recommend going to. 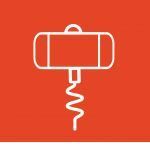 Where to eat it: Casa Labra Calle Tetuan, 12. At Native Spanish Tapas we’ll guide you through some of the best Madrid Tapas during your stay in our city. 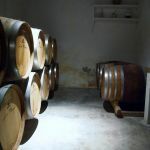 Do join us in one of our many guided Madrid tapas tours! 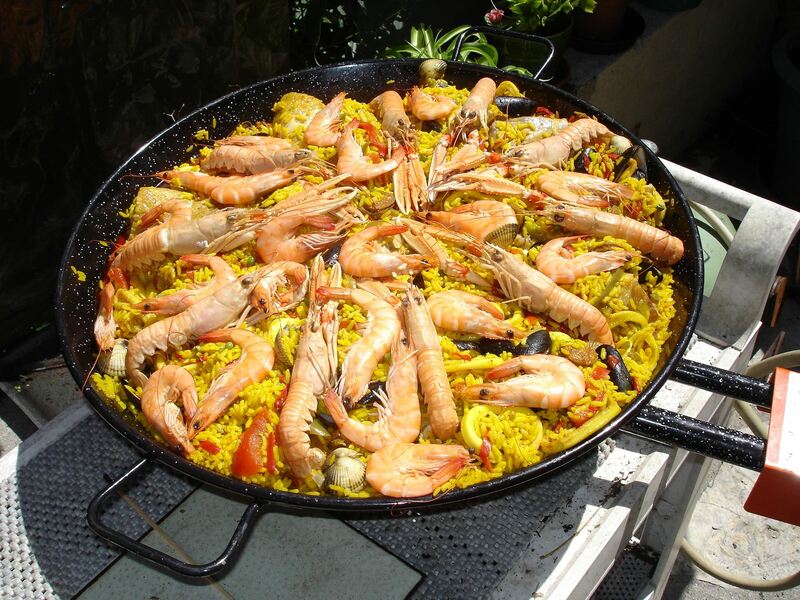 ← Madrid Gastronomy tours and Food Truck?